Why See The Chainsmokers with 5 Seconds of Summer? 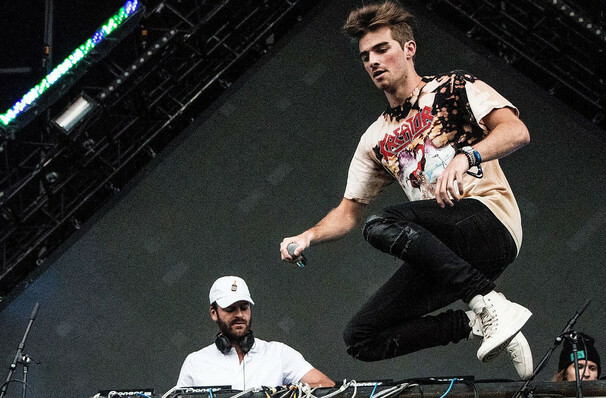 Grammy-winning purveyors of EDM-tinged, dance floor-filling pop The Chainsmokers are bringing their chart-dominating tracks to live venues across North America during the hotly anticipated fall World War Joy arena tour! Having recently collaborated with the New York City-based DJ duo on the radio-friendly smash hit 'Who Do You Love', Australian pop punk quartet Five Seconds Of Summer will be joining as support, alongside rising Canadian chanteuse Lennon Stella. Formed in 2012, The Chainsmokers broke into the mainstream in a big way when their phenomenal debut single Selfie hit top twenty in several countries. Collaborations with the likes of Halsey, Coldplay, Phoebe Ryan and XYLO soon followed, establishing the pair as a hit-making name whose bouncy beats, pop culture lyrical references and instantly singable melodic hooks make chart-topping gold. When it comes to their live shows, expect euphoric drops, special guests and pyrotechnics. Seen The Chainsmokers with 5 Seconds of Summer? Loved it? Hated it? Sound good to you? 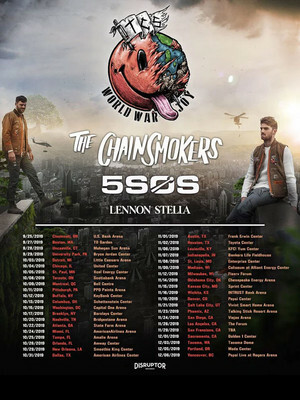 Share this page on social media and let your friends know about The Chainsmokers with 5 Seconds of Summer at Fiserv Forum. Please note: The term Fiserv Forum and/or The Chainsmokers with 5 Seconds of Summer as well as all associated graphics, logos, and/or other trademarks, tradenames or copyrights are the property of the Fiserv Forum and/or The Chainsmokers with 5 Seconds of Summer and are used herein for factual descriptive purposes only. We are in no way associated with or authorized by the Fiserv Forum and/or The Chainsmokers with 5 Seconds of Summer and neither that entity nor any of its affiliates have licensed or endorsed us to sell tickets, goods and or services in conjunction with their events.